Live video is becoming increasingly popular. Mark Zuckerberg certainly sees its potential; Facebook brought its Live streaming function to all users back in December, and now the social network has introduced a slew of new features to the service that could see it draw people away from Twitter’s popular Periscope app. One of the biggest changes is the introduction of Live to Groups and Events, meaning you can make videos visible only to certain people, rather than everyone in your network. Bringing Live to Events, meanwhile, will let broadcasters stream moments from events such as birthdays or concerts. You’ll even be able to use the feature for a Reddit AMA-style live Q&A session, but Facebook's version will have video. The update also sees a video tab taking over Messenger’s slot in the navigation bar at the bottom of the screen on mobile platforms. Clicking on it lets you watch public live streams from around the world, as well as videos from friends. You can also search for videos by topic and see streams from pages you follow. The desktop version, meanwhile, will be getting a Live map as a more visual way to explore public live broadcasts from around the world. The set of reactions that Facebook introduced to its feed last year - Love, Haha, Wow, Sad or Angry – can now be used to react to videos. Selecting one will make it pop up and float across the screen in real time. Broadcasters will also be able to chose from a set of five live filters to add to their streams, and the ability to doodle over videos will be added soon. Finally, Facebook is adding new Live audience metrics that will show how many unique views a video gained while it was live, and a chart showing how many people were watching at any given time. One aspect of Facebook Live that could put it ahead of certain other live streaming services is the fact that it is signing deals with publishers to produce live video content. The company is finalizing a deal with Vox Media, according to The Verge, and is reaching out to actors, athletes, music artists and other celebrities. 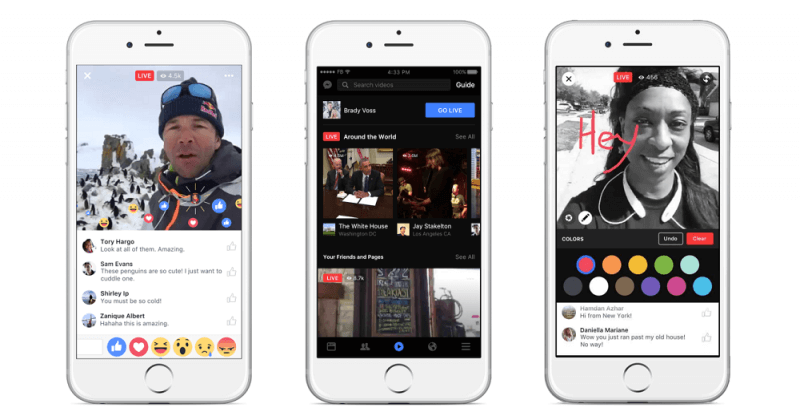 The new Facebook Live features are rolling out over the next few weeks.